Blue Heron on Wrightsville Beach is the upper unit of a great vintage beach cottage with 2 bedrooms (sleeps 6 total, 4 in bedrooms), 2 full bathrooms, kitchen, living room, and private outside courtyard with sitting area and grill. 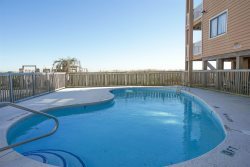 Blue Heron is located on a quiet street on Wrightsville Beach, only a few homes away from a beach access. The private setting is perfect for a quiet relaxing beach getaway. Located close enough (within walking distance) to bars, restaurants, shops, and the fishing pier, but far enough away so you aren't in the middle of everything. The master bedroom has a king sized bed, a nice bathroom, and very large closet. The second bedroom has a full sized bed, and a bathroom is in the hallway right around the corner from the bedroom. The living room has a queen sized pull out sofa. There is a washer and dryer in the unit as well. The fully stocked kitchen is open to the living room and dining area. The living room has a day bed with trundle bed, couch, and chair. Outside you will find a large wrap around deck with both shady and sunny areas to relax. The private courtyard has a gas grill and seating area. There is also an outdoor shower with both cold and hot water.